Insurance Coverage of Contraceptive Product : Pills are $30 a pack. Insurance is not accepted. Other : Prescription length can vary depending on pill type. Patients need to fill out health questionnaire. Other : Prescriptions are valid between 3-6 months. Patients need to fill out a health questionnaire and chat with a physician for an assessment of risks, benefits and appropriate birth control method. Other : Prescriptions are written for 12 months. Patients need to fill out a health questionnaire. Video visits required in Alabama, Alaska, Arkansas, Arizona, District of Columbia, Delaware, Florida, Hawaii, Iowa, Idaho, Kansas, Kentucky, Louisiana, Massachusetts, Maryland, Maine, Minnesota, Mississippi, North Dakota, New Hampshire, New Jersey, New Mexico, Nevada, Oklahoma, Oregon, Pennsylvania, Rhode Island, South Carolina, Tennessee, Texas, Utah, Vermont, and West Virginia. Insurance Coverage of Contraceptive Product : Accepts most forms of insurance; coverage depends on plan. Pills start at $15/month without insurance. Medicaid accepted in California, Illinois, and Texas. Other : Prescriptions are valid for a year. Patients need to fill out a health questionnaire. Does not require or offer video visits. Insurance Coverage of Contraceptive Product : Pill packs starts at $15/month without insurance but may be covered by insurance, although co-pay or deductibles vary depending on plan and brand of product selected. Pandia Health accepts most forms of insurance, including Medi-Cal. Does not accept Anthem, Kaiser, or TRICARE. Other : Prescriptions are valid for a year. Patients need to fill out a health questionnaire, which is reviewed by a doctor before a prescription is written. The doctor may contact the patient if there are any questions or concerns. Insurance Coverage of Contraceptive Product : Cost varies by state, starting at $20 a pack. Insurance is not accepted. Other : Prescriptions are valid for a year. Patients complete a health assessment. Video visits required in Alaska, Arizona, California, Idaho, Florida, and Utah. Insurance Coverage of Contraceptive Product : Check pharmacy for insurance coverage. Medicaid accepted only in California. Other : Patients need to fill out a health questionnaire. Requires video visits. Insurance Coverage of Contraceptive Product : Pills are $20 per pack. Insurance is not accepted. Other : Initial prescription is valid for 3 months; if there are no issues after these first 3 months, a patient can auto-refill their prescription for a year. Patients need to fill out a health questionnaire. Video consultations required in Arkansas, Hawaii, Idaho, Iowa, New Hampshire, New Mexico, Vermont, and West Virginia. Insurance Coverage of Consult Fee: Covered, but may require co-pay depending on plan. The Pill Club will cover the fee if insurance does not. Insurance Coverage of Contraceptive Product : Insurance may cover medication. Without insurance, pills start at $7 a month. Accepts most insurance plans including Medi-CAL and Family PACT. Takes select Medicaid plans in certain states. Other : Prescriptions are valid for a year. Patients need to fill out a health questionnaire. No video consultations offered or required. Insurance Coverage of Contraceptive Product : Accepts major commercial insurance. Does not accept Medicaid. Without insurance, pills start at $15 a month. Other : Prescriptions written for 12 months. No video visit required. Insurance Coverage of Contraceptive Product : Accepts all major insurance except Medicaid. Without insurance, pills start at $18 a month. Other : Prescriptions are valid for a year. Automatic refills. Patients need to fill out a health questionnaire. Audio consultations offered but not required. Insurance Coverage of Consult Fee : Covered, but may require co-pay or deductible depending on plan. Medicaid not accepted. Other : For new users of birth control, an initial prescription is for 3 months; if there are no issues after these first 3 months, a 12-month prescription can be provided. 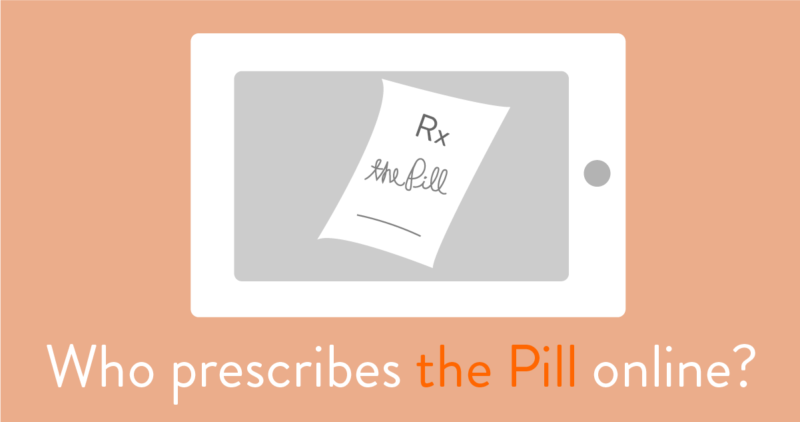 For previous or current users of birth control, a 12-month prescription can be issued. Patients need to fill out a health questionnaire. No video consultations offered or required. Other: Prescription length can vary depending on pill type. Patients need to fill out a health questionnaire. Other: Prescriptions are valid between 3-6 months. Patients need to fill out a health questionnaire and chat with a physician for an assessment of risks, benefits and appropriate birth control method. Other: Prescriptions are written for 12 months. Patients need to fill out a health questionnaire. Video visits required in Alabama, Alaska, Arkansas, Arizona, District of Columbia, Delaware, Florida, Hawaii, Iowa, Idaho, Kansas, Kentucky, Louisiana, Massachusetts, Maryland, Maine, Minnesota, Mississippi, North Dakota, New Hampshire, New Jersey, New Mexico, Nevada, Oklahoma, Oregon, Pennsylvania, Rhode Island, South Carolina, South Dakota, Tennessee, Texas, Utah, Vermont, and West Virginia. Other: Maven does not have a platform-wide policy on the length of time prescriptions are valid, and relies on practitioners to use their clinical judgment. Insurance Coverage of Contraceptive Product: Accepts most forms of insurance; coverage depends on plan. Pills start at $15/month without insurance. Medicaid accepted in California, Illinois, and Texas. Other: Prescriptions are valid for a year. Patients need to fill out a health questionnaire. Does not require or offer video visits. Insurance Coverage of Contraceptive Product: Pill packs starts at $15/month without insurance but may be covered by insurance, although co-pay or deductibles vary depending on plan and brand of product selected. Pandia Health accepts most forms of insurance, including Medi-Cal. Does not accept Anthem, Kaiser, or TRICARE. Other: Prescriptions are valid for a year. Patients need to fill out a health questionnaire, which is reviewed by a doctor before a prescription is written. The doctor may contact the patient if there are any questions or concerns. Insurance Coverage of Contraceptive Product: Cost varies by state, starting at $20 a pack. Insurance is not accepted. Other: Prescriptions are valid for a year. Patients complete a health assessment. Video visits required in Alaska, Arizona, California, Idaho, Florida, and Utah. Insurance Coverage of Contraceptive Product: Check pharmacy for insurance coverage. Medicaid accepted only in California. Other: Patients need to fill out a health questionnaire. Requires video visits. Insurance Coverage of Contraceptive Product: Pills are $20 per pack. Insurance is not accepted. Other: Initial prescription is valid for 3 months; if there are no issues after these first 3 months, a patient can auto-refill their prescription for a year. Patients need to fill out a health questionnaire. Video consultations required in Arkansas, Hawaii, Idaho, Iowa, New Hampshire, New Mexico, Vermont, and West Virginia. Insurance Coverage of Contraceptive Product: Insurance may cover medication. Without insurance, pills start at $7 a month. Accepts most insurance plans including Medi-CAL and Family PACT. Takes select Medicaid plans in certain states. Other: Prescriptions are valid for a year. Patients need to fill out a health questionnaire. No video consultations offered or required. Insurance Coverage of Contraceptive Product:Accepts major commercial insurance. Does not accept Medicaid. Without insurance, pills start a $15 a month. Other: Prescriptions written for 12 months. No video visit required. Insurance Coverage of Contraceptive Product: Accepts all major insurance except Medicaid. Without insurance, pills start at $18 a month. Other: Prescriptions are valid for a year. Automatic refills. Patients need to fill out a health questionnaire. Audio consultations offered but not required. Insurance Coverage of Consult Fee: Covered, but may require co-pay or deductible depending on plan. Medicaid not accepted. Insurance Coverage of Contraceptive Product: Check pharmacy for insurance coverage. * It is possible state laws and online prescriber policies may have changed since this chart was last updated on March 1, 2019.